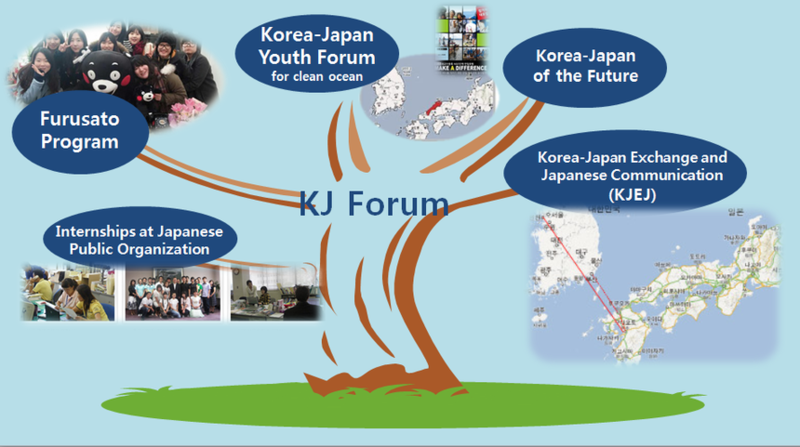 The KJ Forum was founded in 1999 to promote cross-cultural and intellectual exchange between Korea and Japan. To actively build Korea-Japan relations, KJ Forum regularly cooperates with local Japanese authorities and organizations. The KJ Forum also is a Non-Governmental Organization (NGO) registered with Korea’s Ministry of Foreign Affairs. Since KJ Forum is a non-profit government organization, the HIROBA Company was created to manage the financial and taxation affairs of KJ Forum. In October 2013 HIROBA was registered with the Office of National Tax Administration. The role of HIROBA is to support KJ Forum’s operation as an independent NGO and to sponsor the income or profit-making programs that will allow KJ Forum to meet their financial budget and comply with taxation regulation. The term ‘internship’ was first implemented in the USA during the 20th century. While open to broad interpretation, the term internship is often used as an on-the-job training opportunity provided for students to explore their career interests and consolidate their vocational path. Internship opportunities in Japan include: public organizations, venture organizations, the Kumamoto International Foundation, The Japan Chamber of Commerce and Industry, newspaper agencies, bureaus of NGO, broadcasting stations, hotels and resorts. Accommodation and wages vary depending on each organization and applicant. If you are interested, please submit the application form below. Date: 4-Week Program (Commencing the 1st day of each month) ※Accommodation is available for 3 months (Fee involved). The Kumamoto Transportation Center: 1 minute walk/The Central Post Office & The Civic Center: 3-minute walk/Kumamoto castle: 5-minute walk. Ideas on Korea-Japan relations by the future generation! <The Korea-Japan of the Future>is a forum place where a group of the next-generation youth share their opinions on the future of Korea-Japan relations. We hope that this forum provides an opportunity for future generations to make sustainable and feasible plans to overcome historical obstacles of the past and build mutual understanding and trust between the two nations. We invite both Korean and Japanese undergraduate and postgraduate students and Japanese and Korean individuals who are interested in Korea-Japan relations to participate in the second Korea-Japan of the Future on 8th of November 2014. If you are interested in joining the executive committee or participating as a debater, please submit the Application Form below. There will be bi-lingual Korean-Japanese interpreters to assist in the forum. Enjoy cultural experiences while staying with Japanese college students in Japan and taking the opportunity to improve your Japanese language skills! Main Topics include: Japanese Language Study, Presentations, Cultural Experiences, Excursions, Focused Group Work. For more information on Asia Hope Work Camp, please click here. This program provides an opportunity for Japanese and Korean-Japanese to learn about Korean history and experience traditional Korean culture. Volunteer students (between one to five assistants) accompany those on the Korean Cultural Experience Tour. Application is made through telephone or email (Include: name, contact number and the number of people attending). This tour also includes: 1-Day Train Trip and/or a Korean Cultural/Historical Experience (1 night-2days). The Korea Japan Forum is sponsored by the national governments of Korea and Japan, corporate and private businesses and individuals from both nations. We would like to express our heart-felt gratitude towards all sponsors. The sponsors’ invaluable support allows KJ Forum to establish a strong international youth exchange program and encourage a positive relationship between Korea and Japan. 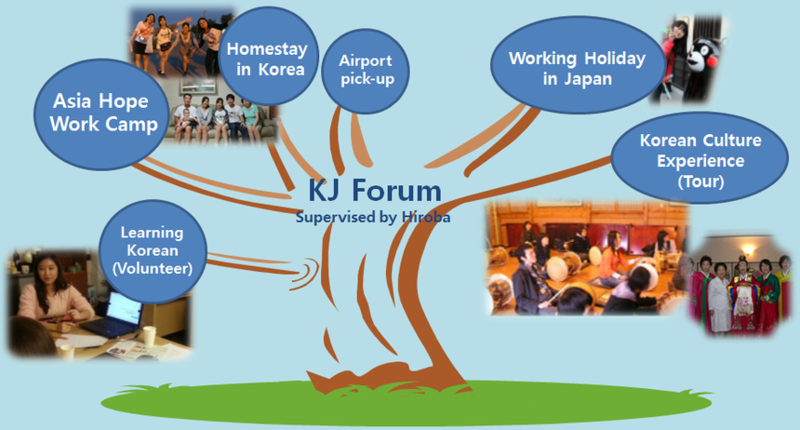 In order for KJ Forum to sustain its various and effective programs, a membership program was introduced in October 2010. We appreciate and thank you for your loyal support and look forward to your participation. Membership period commences on payment date for one year. primarily be selected in case of application. Q : Are Non-Profit Organizations (NPOs) permitted to charge program participants to meet budget and revenue costs? A : Yes. A NPO is an organization that uses surplus income to fund its goals rather than distributing them as profit or dividends. The Korea Japan Forum strives to strengthen Korea-Japan’s mutual understanding and communication, and supports activities for international exchange.